The ageing Gabba has suffered an embarrassing failure a week out from a day-night Test match after a power outage saved the Brisbane Heat from defeat on Thursday night. 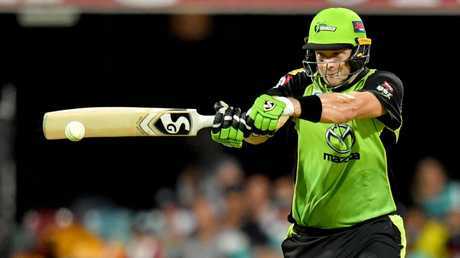 A light tower went out during the Heat's run-chase against the Sydney Thunder, causing the Big Bash League match to be abandoned in farcical circumstances. The Heat were only three overs into their innings and sitting precariously at 2-10 in reply to the Thunder's 4-186. With "Bash Brothers" Chris Lynn (4) and Brendon McCullum (0) back in the dressing room, the Thunder were heavy favourites to win the game. The match was declared a non-result after an hour delay given the Heat had faced less than five overs, leaving 26,644 fans disappointed. The light tower ironically came back on less than 10 minutes after the match was called off and the Thunder are planning to appeal the result. "Cricket Australia will work with Stadiums Queensland and the power authority to investigate reasons for this occurring and update in due course," a Cricket Australia spokesman said. "Points will be split between the Heat and Thunder." While the power outage saved the Heat, it was terrible timing ahead of next week's Test. Australia will host Sri Lanka at the Gabba from Thursday in a pink ball Test which relies on lights to be played. The BBL is a Mickey Mouse competition compared to high stakes Test cricket which will be beamed around the world, especially a day-night match. The outage affected a large part of the Woolloongabba and East Brisbane area, especially the Stanley Street end of the Gabba. 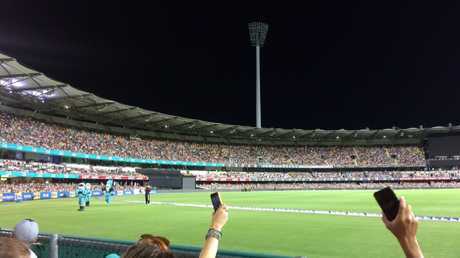 It was external to the Gabba, meaning stadium staff could do nothing to rectify the situation. The outage was being investigated by Energex and has raised concerns about the Gabba's back-up power plans. The Gabba has dropped to the No. 5 ranked Test venue in Australia and was overlooked for a match against India this summer. It received a Sri Lanka Test as a consolation but questions will now be asked about the venue's suitability to host day-night cricket. The Thunder offered to only bowl spin with three light towers still functional, however the Heat would not agree to that and umpires deemed the conditions unsafe for play and crowd safety.